The NHL is one corporation that rarely takes steps back when it comes to new technology. They've changed the materials and shapes of the jerseys to make players reportedly faster. They've reduced goalie equipment to increase scoring. They're installing chips into jerseys now in order to track ice time and player movement on the ice. All of these changes will not be going away anytime soon. It seems, though, that one broadcaster is going to jump back two decades tomorrow as Fox Sports West will broadcast the Edmonton Oilers-Los Angeles Kings game with the help from the FoxTrax Puck! According to reports, "[t]he puck comeback is part of the Kings' Hockey Night in LA promotion, as Fox Sports West will turn back the clock to the 1990s." "We won't be able to give the speed of the shot," Fox producer Steven Dorfman told Kevin Allen of USA Today. 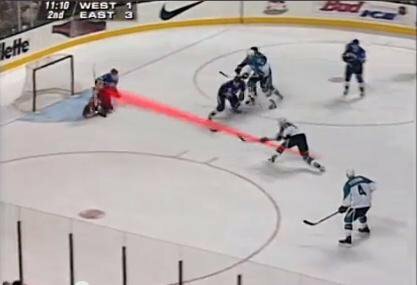 "But we can simulate the glow of the puck, and we can simulate the tracking of the puck. Not live, but we will show some plays in the first and second intermissions, and maybe a couple of clips in-game and postgame on what it would look like if that technology still existed." As much as I hated the FoxTrax puck, the fact that Fox Sports West is going full retro with their efforts is rather impressive. Using it on highlights and clips is actually a better way to utilize the technology, in my humble opinion, than using it in-game as it can show all sorts of things like path of the puck when the puck is deflected or passing lanes when setting up tip-ins or redirections. Kudos to Fox Sports West for having a little fun with their broadcast on Saturday night. The Oilers and Kings were part of the biggest deal in the 1990s when Gretzky was sent south by the Oilers to the Kings, and that deal led to the sunshine belt's expansion as Wayne Gretzky became a household name in southern California in the early '90s. While Saturday's game won't have the same mystique as an early-90s tilt between the Oilers and Kings, seeing Fox bring back the craziness from that era will be a fun touch to what amounts to a fairly insignificant game on the NHL schedule in January.